For the past six weeks, I’ve been testing the Velo Transit (VT) Edge 40 backpack, as well as the Metro 20 Pannier (which I’ll review in my next post). My version of the Edge 40 was the men’s medium (it also comes in a men’s large and women’s small) and also included the add-on water bottle pocket. The pack itself retails for $225 and the bottle carrier is a $20 add-on. The Edge 40 (the 40 stands for 40 liters, by the way) falls into Velo Transit’s “Urban” category of bags, and while I’m a little puzzled by their distinction of “urban” and “commuter” – to me those terms evoke similar needs – it makes a lot of sense as an everyday pack. It has a cavernous main pocket with a roll top and 4 zippered pockets on the back (front?) – two that bump out a little (VT calls it a “volumetric pocket”) to give some volume, and two flat pockets behind those – one half-length and one full-length. VT’s site says the flat pockets are for things like locks, wallets, computers, etc. and the “volumetric” ones are for tools and a “catch-all.” Unfortunately, I read that description AFTER using the product, so I ended up putting everything in what was apparently the wrong place… but thanks to this experience, I can reassure any hesitant buyers that the tools pocket will carry a wallet, the wallet/valuables pocket will carry tools, and the “catch-all” pocket will carry a lock. Over all of those pockets goes a zip-down “storm shield” that also happens to be bright yellow and is very good for visibility. It can roll up into a small velcroed pocket at the top, but I generally thought visibility was a good idea and rode with it down – it also gave the pack a sleek look that I liked. 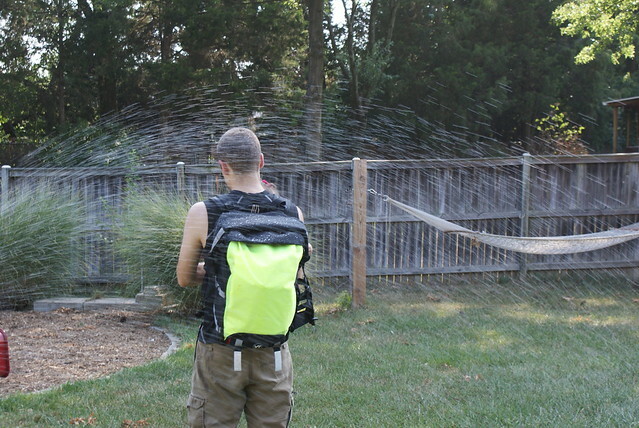 The Edge 40 is a highly adjustable pack – despite being sized – and I was able to get it to fit me very well. It also had enough adjustments to cinch down whatever I wanted to carry so it wasn’t banging around inside the generally larger-than-necessary main pocket. Speaking of which – the Edge 40 is probably larger than necessary for most commuters. I probably had room to bring two sets of clothes and two lunches in this pack with room left over. If I were to buy a pack from Velo Transit, I might go for the Edge 30 – it’s a little smaller but otherwise identical. – Because it is a fairly large pack, my visibility when glancing over my shoulder was compromised. I was able to adapt somewhat, but I could not see as well as I can with other packs or bags. – There are a lot of straps. This is generally good, but the ends flap all over the place, sometimes hitting me in the back of the neck and making me think I had just gotten hit (or bitten) by a bug. Some type of retention would be nice. – The price is pretty high. To be fair I think Velo Transit is providing high quality for that price, but it is higher than many similar products. 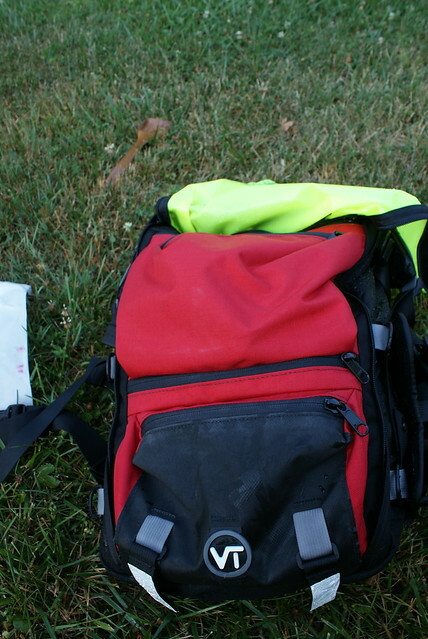 Although the waterproof claim is one of the high points of this pack, I never got to check it out on my commute during our test period (yes, I had to give it back!). 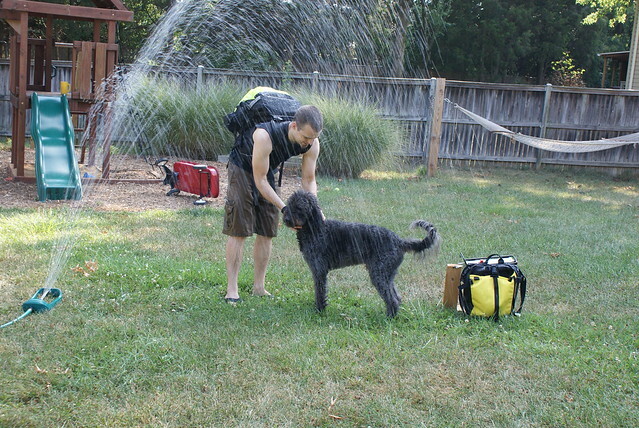 In an effort to give full rigor to the test period, I did expose the pack to a prolonged watering period with my sprinkler – much to the amusement of my family and dog! According to my very scientific tests, the Edge 40 main compartment passes the waterproof test after approximately 30 minutes under direct sprinkler. 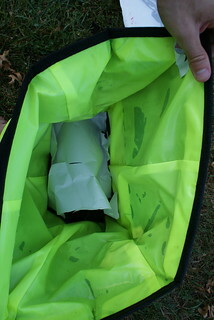 The “storm shield” proved to be slightly less effective – paper I placed directly underneath it still got slightly wet – but the contents of the outer pockets were still dry. In the end I have to give a lot of credit to Velo Transit for the quality they provide – if you’re looking for a commuting backpack and the price doesn’t dissuade you, the Edge 40 is a very strong contender.